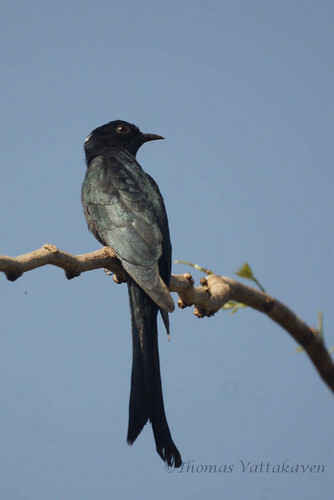 Having posted about two different species of Drongos before, when i saw this bird, I thought I was looking at a third species of Drongo. 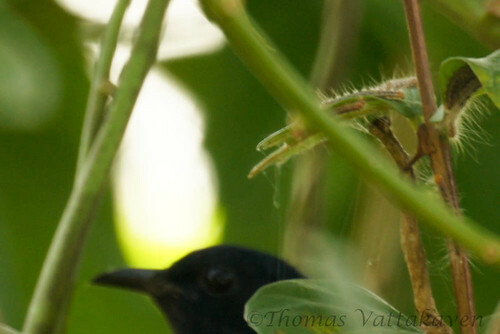 The bird sat atop a Guava tree, leisurely pecking off a group of caterpillars from an adjoining leaf. It is that behaviour that seemed to give it away. Unlike the noisy flamboyant display by true Drongos, this bird was subdued and didn’t utter a sound. 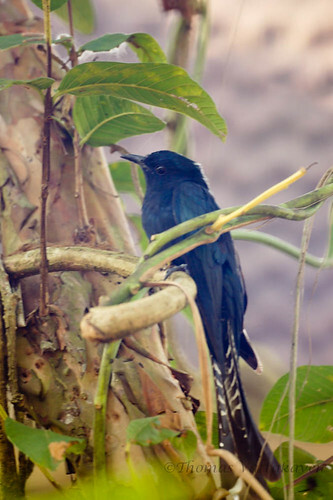 Although looking like an Ashy Drongo, this bird is actually a Drongo-cuckoo (Surniculus lugubris) also called as the Asian Fork-tailed Drongo-cuckoo. 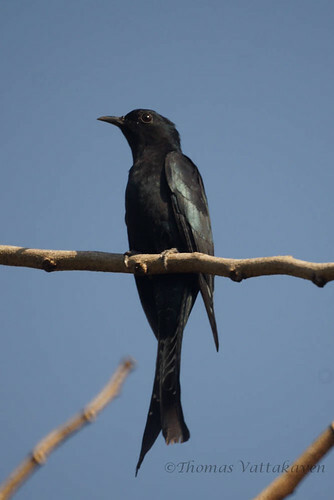 Two features help to distinguish the Drongo cuckoo from the Drongo. One being the obvious barred vent (undersides of the tail), and the other being the thinner beak. 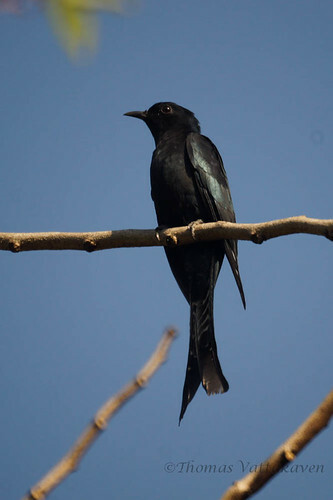 There is also a small white spot on the back of the head of the Drongo-cuckoo. 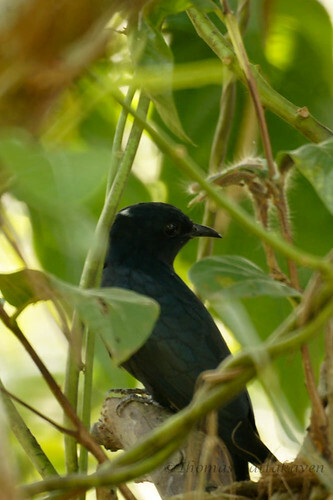 Compared below are images of both the birds. 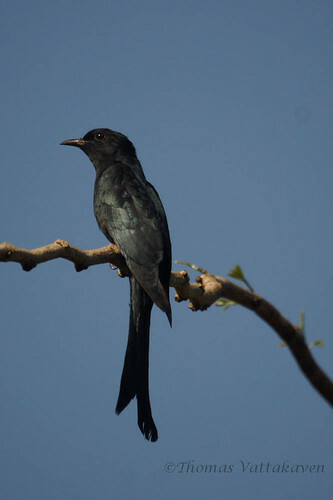 On the left is the Drongo cuckoo while on the right is the Ashy Drongo. 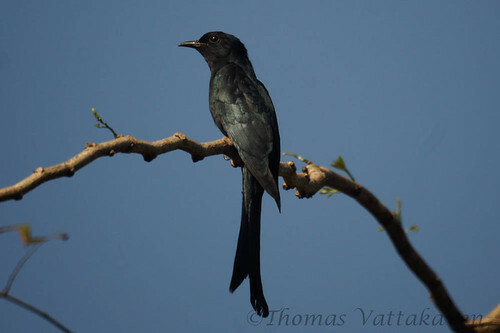 Like other Cuckoos, this one is also a Brood parasite on small Babblers. For more information see here. Nice one, Tom. I like the way you have compared the cuckoo with the drongo. But you're right. At first glance, you can pass it up for a drongo.